To celebrate this year, I made these little minions for the kiddos in my family. It was really easy because I used this printable template of the hearts. I just colored them in with crayon, outlined them with marker, and cut them out. As for the head lamp, I cut thin strips of black card stock (they don’t have to be perfect), and used a hole punch for the blue-grey lamp part. I had some googly eyes in my craft bin, and couldn’t think of a better time to use them. I finished these guys off by using a sharpie to make the mouth. You could switch up the look by printing the hearts on colored paper, or using white paper and a marker for the eye. 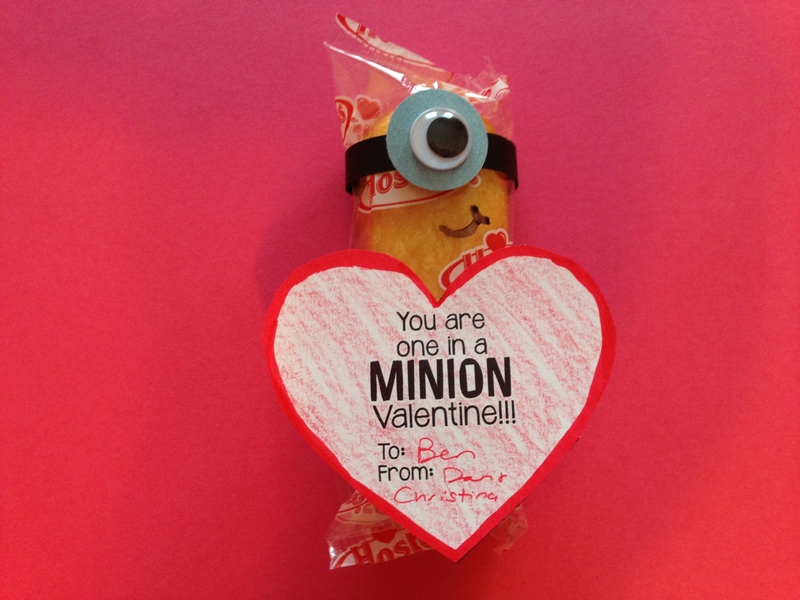 Even if you haven’t seen Despicable Me, this is still a super cute Valentine’s Day treat. Hurrah for the return of Twinkies, which made this project possible.